Watertown, NY - The Watertown Wolves rang in their first home game of the season at the Watertown Municipal Arena on Friday with Ring Night. The night included a ceremony where players from last season's championship team were presented their rings, commemorating their success in the 2018 Commissioner's Cup. Following the ceremony, the championship banner was displayed next to Watertown's first Federal Hockey League Championship banner, making them the first team in the league's history to win more than one championship. The Wolves saw several of their players from the previous season return to make another run for the Commissioner's Cup. Leading the team again this season is Head Coach Trevor Karasiewicz, who now has three rings in five seasons as a head coach in the league. Last year's league-leading scorer Tyler Gjurich returns to the offense, looking to rack up a third season with fifty or more goals. Playoff MVP Gavin Yates makes his return to Wolves adding to the scoring threat of the team's offense. The offense also includes returning players Anton Lennartsson and Troy Polino. Defensemen Kyle Powell, Justin Coachman, and Aleh Shypitsyn make their return for the 2018-2019 season as well. Returning to protect the goal for the Wolves is Cody Karpinski. The Wolves played their first game of the season on the road, visiting the newest team to the league, the Mentor Ice Breakers in Ohio. Watertown returned from that venture with a 4-1 victory and looked to build on that momentum in a rematch of last season's Commissioner's Cup Finals with the Port Huron Prowlers of Michigan. It was a physical first period. Watertown's new acquisition, Justin Portillo checked Prowler Austin Fetterly into the boards inciting Port Huron Head Coach and defensemen Joe Pace, Jr. to come to his teammate's defense. The scrum resulted in Portillo receiving two minutes for boarding and Pace, Jr. getting a roughing penalty. Former Dasher Brandon Wahlin scored the first goal of the game for Watertown, with assists from Aleh Shypitsyn and Christian Whitcomb, who were also acquired from Danville. The next rise in tension resulted in new wolf JB Sweeney getting a roughing penalty. George Holt, another new acquisition for the Wolves, extended the lead for Watertown on a play from Troy Polino and Tristan Perreault-Gagnon with just under four minutes left in the period. The Wolves held on to the 2-0 lead for the remainder of the first period. Nathan Robson put the Prowlers on the board eight and a half minutes into the second period via Joe Pace, Jr. and Matyas Kasek. Each team killed off a penalty before some shoving between Anton Lennartsson and Matt Graham while Watertown's Justin Portillo made Alex Johnson have a seat on the ice. The shenanigans resulted in two roughing penalties for Watertown and one roughing penalty for Port Huron. The penalties provided Port Huron their next scoring opportunity, tying the game with a buzzer-beater by Zachary Zulkanycz on assists from Yianni Liarakos and Joe Pace, Jr. The Prowlers took the leadin the third on a power play goal from Joe Pace, Jr. and held the lead for the remainder of the period to end the game with a score of 3-2 in favor of Port Huron. The 1st Star of the Game was awarded to Joe Pace, Jr. with a goal and two assists. Watertown's Brandon Wahlin earned 2nd Star with one goal. Port Huron's Zachary Zulkanycz was given the 3rd Star with one goal in the game. 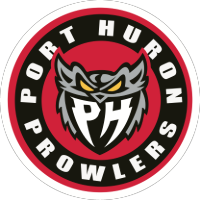 The Watertown Wolves will host the Port Huron Prowlers again tomorrow night at the Watertown Municipal Arena to finish the weekend series with Race Night. The game starts at 7:30 PM.